There are two kinds of people in a startup, one who need to be told what to do, and other who just need a vision. Sreejith belongs to second category & his subject knowledge with innovative skills is a very rare combination. His passion to making a difference has helped him climb the ladder of success. After completing his MBA from symbiosis, he started his career in human resource department. All though out his career, he has worked in the human resource background across various functions. He has more than a decade of experience in the Corporate HR across geographies of India, Mainland China & Europe. The idea behind this startup came due to personal experiences of both the founders. Close family members of both the individuals were lost due to health issues. These incidents made them ponder over the need for healthy food to promote better health and reduce the risk of diseases. 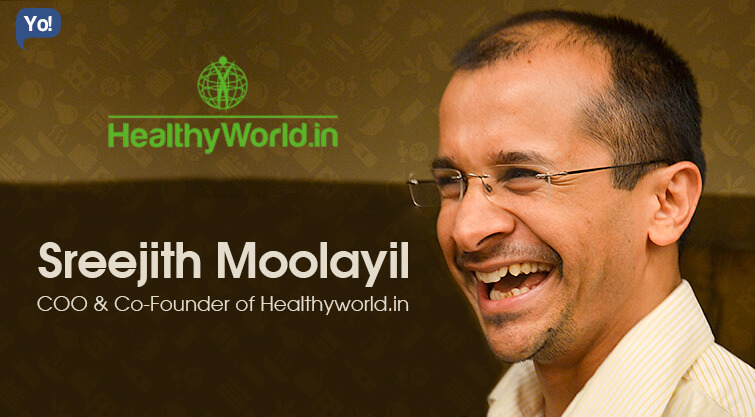 Within a few months of its inception, healthyworld.in has received huge appreciation with in the country. HealthyWorld.in helps identify, validate, and shop functional foods which promote better health and reduce the risk of diseases. Both my Cofounder Puru and myself lost our close family members for lifestyle health issues.Over a period of time we realised that HEALTH is Food that you eat first and then everything else, whether it is Exercise OR Environment OR Stress etc . This made us realise an existing gap in the existing Food space where people are loaded with Products and Information leaving them confused what to choose. This is what we are addressing through HealthyWorld. We have built a platform where one could get such genuine health foods and we are in the process of integrating a tool to make the process of Identifying & Validating what they should choose from the wide arena of health foods available. We have been using this tool internally for some time to choose the launch best health food under our own label “ TRUE ELEMENTS”. We see merit in allowing the access of this tool to help everyone compare and validate scientifically the best food for each individual. Life is way of connecting your past dots to future dots, where each experience whether positive or negative becomes a dot. Never give up hope as long as you are creating dots. Journey is never challenging as long as you started it with a commitment that you will never give up; success or failure is not the destination those part of the journey. Luckily we have Our Team, Mentors and foremost Family who keep reinstating us with self-belief continuously which makes us fight all the challenges with new vigour. Initial investments were from both Puru and Me of close to 100KUSD followed by intermittent investment from friends and family until Jan 2015. That is when we raised 200k in from a group of investors including a Surgeon & Digital media serial entrepreneur. This group of investors has given us free hand to operate with them on call. They have added immense value in getting us the focus and helping us in recalibrating the opportunity. We would be seeking next round in another couple of months, which would be purely to scale our operations to the next level. We have tried to make each of our employee part of each decision and they are kept abreast on the developments since day one. This has been our thought process to get their buy in to company’s vision. We have daily report, weekly updates and monthly communication sessions towards this. Focus – Your dots need to be closer to increase the pace and narrow the range. Compassion – This would make your team stick together in your journey and such team effort will build long lasting and faster success. To do list for every day is one thing which makes all that difference, though I am still not happy the way the day actually spans at the end with many open To do’s. I am more of creative kind and as such I have to force myself to focus on things in hand rather than picking a new rope. Never give up, if a Manjhi with chisel could break a hill open what we are chasing is pretty much doable as long as you keep chiselling. Tools might break, weather might change, your coworkers might change but as long as you believe and continue HILL WILL BREAK. Looking outwards is as important is looking internal, the balance of both is very important to wade your company through challenges. Most of us focus on either and that gives us a lot of surprise on the way. There are forces beyond your control, as such those shouldn’t affect your confidence and be immune to them. In the beginning, everything used to affect me but then we realised, if we get affected company would get affected and everyone in the organisation also would. That is not worth it !! We will be a reputed brand for people to get an unbiased Health food validation and purchase and we will multiple our topline by 70 times of what it is today. I will start out on my own early and would have loved to do LOADS & LOADS internships during my college & school days. I haven’t travelled much beyond India, I grew up in Kerala, Colleged from Managalore and Pune. I love being in beaches of Konkan, Backwaters of Kerala and forests around Canara.